"I have work to do. Read your newspaper every day and you'll understand." Believe it or not, The Punisher has two, non-franchised films, shot with drastically different budgets and styles. The older take on the character was 1989 low budget junk starring Dolph Lundgren; a vehicle whose sole purpose was to take advantage of the super hero explosion brought about by Tim Burton's Batman. With a much bigger budget in tow and an even bigger super hero surge underway, the character was revived in 2004's The Punisher, this time, unfortunately, with John Travolta. 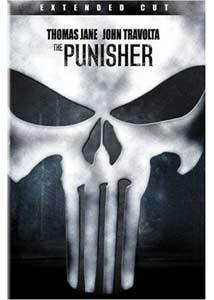 Frank Castle (Thomas Jane) is an undercover FBI agent who is on his last pre-retirement mission. At the tail end of the job, Frank accidentally has a part in the death of the son of a crime boss. The boss, Howard Saint (John Travolta), learns the identity of his son's killer, and puts a hit out on the Castle family. After the hit is carried out, Frank is left bloodied and alone, with one thing on his mind: vengeance. This Dolph-less version is often forgotten when discussing the recent comic-bookto-movie surge. It's always Spider-Man this and Superman that, while the harder-edged, grittier Frank Castle saga is given the shaft. Hopefully this extended version of the film will finally generate more interest, as it is superior to the theatrical cut. It isn't any softer or campier though, which could drive prospective audiences even further away. The addition of extra footage can't hide the film's numerous flaws either, and actually brings about a few more, thanks to more exposition, which comes across more as filler than anything substantial. Most of the new footage involves the Jimmy Weeks (A. Russell Andrews) character, who wasn't very interesting to begin with. The real highlight of the bonus additions, though, is an animated opening sequence. Using still shots of the actors, we see Frank Castle in action during the Gulf War. This is a very bloody few minutes, but we do get a real feel for the internal anger and rage inside Castle, and how he was able to easily "transform" into The Punisher. Still, I can't escape the sense that a bigger star might have propelled this film to bigger and better things. With a more marquee name (even though American action heroes are hard to come by these days), the box office numbers might have been higher and the producers might have shelled out a bit more for the budget as well. The rest of the cast is nothing special either, even with Roy Scheider and Rebecca Romjin on board. Travolta once again almost single-handedly destroys a film, mugging for the camera whenever possible and subsequently ruining every scene he's in; he just continues to prove that his work in Pulp Fiction was the ultimate fluke. Overall, there's just too much of a B-movie feel to take it to that next level. I'm all for the joys of B-movies, but with the big-budget, blockbuster comic book competition out there, even this extended cut disappoints. Image Transfer Review: The video is an anamorphic 2.35:1 widescreen transfer that is above average but unspectacular. The images are sharp and detailed, despite a few instances of softness, while blacks and contrast levels never falter. The color scheme is nice, regardless of the setting, with blues standing out during the island sequences, and dark hues looking true while the dingy, grittier set pieces play out. There is some dirt and grain, but nothing too distracting. Audio Transfer Review: The audio options are Dolby Digital 5.1 EX and DTS 6.1 ES, with the latter getting the slightest of edges due to a bit more of a bass punch. Both mixes are outstanding, making as active use of the surrounds as possible. The dialogue clarity holds up amazingly well at all times, even when the pace of the action-oriented sound effects is at its highest. Extras Review: There are only a few extras with this release including an impressive Animated Introduction. This sequence can be viewed as part of the film or separately, and it does a great job setting up the internal anger that resides inside the Frank Castle character. Tour of Duty: Making the Extended Cut is a nine-minute featurette that explores the nuances of this version of the film. Much time is spent on the animated opening, but there's also some juicy information divulged by director Jonathan Hensleigh and comic book artist Tim Bradstreet. There's also a Marvel Comic Book covers gallery and a collection of previews for other Lionsgate releases. It's a bit more interesting, but this extended cut of The Punisher can't quite save the film from mediocrity. The revenge tale still suffers from a slow pace and the presence of John Travolta, but the new opening sequence should be seen. Lionsgate's single-disc treatment has solid video and excellent audio along with a nice batch of extras that will more than please the film's fans.